“So, how did you get hooked on Dali?” people ask me all the time. “Soft Construction with Boiled Beans,” I reply. My entrée to the world of Dali. 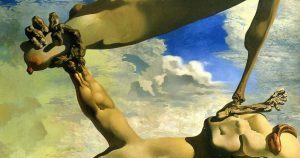 That great 1936 painting was the door that opened the world of Salvador Dali to me. At the time, around 1968, I knew it solely by that title. The rest of the title – Premonition of Civil War – was never included in any references to the painting, as I recall. Not at that time, anyway. Later, it somehow seemed to appear as the full title. But no matter. The fact is that this single canvas was the one that got me. Not the Persistence of Memory, or Christ of St. John of the Cross, or others that could have been the initial hook. 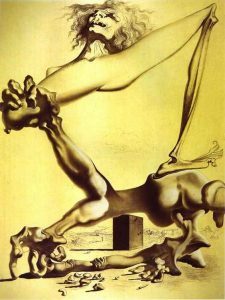 Nope, not them; it was Soft Construction with Boiled Beans – a title I used to delight in repeating to people, when they asked me how I got into what would become a lifelong study of Salvador Dali’s life and work. This preparatory study itself is museum-quality. Actually, the term “soft construction” seems rather indistinct for a Dali painting, doesn’t it? Generally his titles are more specific, more concrete. “Soft construction” just seems a bit obtuse for what is in fact a very precise, purposeful, and powerful artistic statement. And the “boiled beans” part sounds like an amusing afterthought – as if, oh, yeah, let’s throw in some boiled beans for good measure. Ha! (It turns out, too, that the appearance of the Lenin figure walking aimlessly at lower left also appeared the same year in The Chemist of Ampurdan in Search of Absolutely Nothing). In 1968, I was sitting in an art appreciation course my freshman year of college. By 1971 I graduated with a degree in magazine journalism from Ohio University. But in ’68 I knew little about journalism and even less about Surrealism. 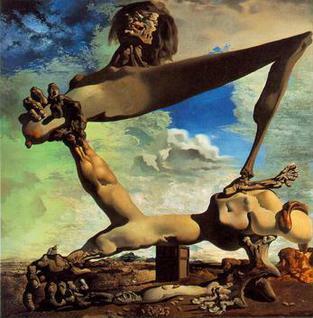 Until the professor, giving a slide lecture, showed one work by Salvador Dali: Soft Construction with Boiled Beans. Baam! The image hit me like a giant rock plucked from the environs of Cape Creus! I loved the anguished look of the central figure, even though I had no informed understanding of what I was seeing. The fluidity of form spoke to me. Here was a highly imaginative work, skillfully painted. In some respects it had a kind of photographic quality to it. And I loved the luscious lime green and other colors. I had to find out more – much more – about the man who painted it. Which led me to literally run to the library after class to look up anything and everything I could get my hands on about Salvador Dali. No internet in those days, of course. And not much in O.U.’s library, either. But enough to whet my appetite, after I’d just had a delectable horse d’ oeuvre when that slide appeared on the screen. Pathetically, the professor wasn’t kind. 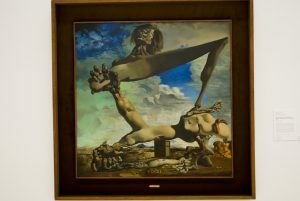 In talking about various styles of art, he said of the Dali picture, “And then there are things like this!” It seemed clear he was using a sardonic tone, as if to dismiss Dali as someone not to be taken very seriously. Indeed, at that time the art world was largely down on the artist, primarily because they didn’t understand him, and his antics got their professorial knickers in a knot. Never mind that professor; I thought the Dali work was genius. 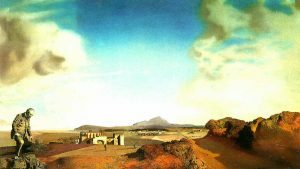 Fast forward some five decades, and the esteemed art critic for TIME magazine, Robert Hughes, declared in a TIME article that, in his view, the greatest war picture of the 20th century was Salvador Dali’s Soft Construction with Boiled Beans; Premonition of Civil War. No, not Pablo Picasso’s Guernica. Sorry, Pablo. Somehow I just knew, when I saw a slide of this painting back in my college days – and, of course, I’ve seen the work in person several times (it’s in the Philadelphia Museum of Art) – that it was something special.